The last thing on my mind after our annual house spring cleaning event was another toy. But, Pop Oh Ver, the pretend kitchen counter top set, was a welcome exception! 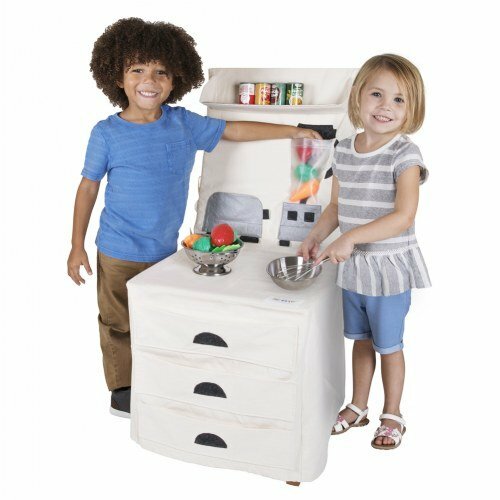 Whoever designed this pretend play kitchen had both the parents and kids in mind. 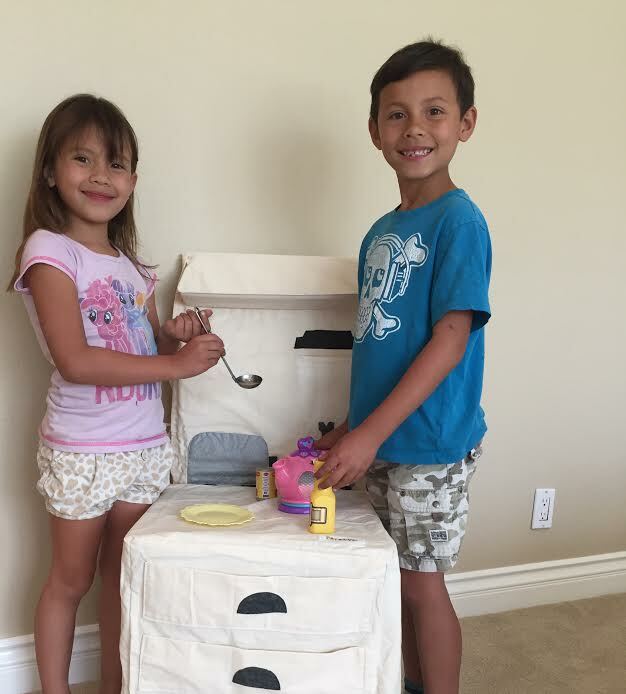 The kitchen set can entertain kids for hours while the clean-up time was done in less than a minute! Pop Oh Ver is a compact kitchen counter top set made of a durable, thick canvas. It came neatly folded in a small flat box. To set it up, all I needed was my dining room chair. 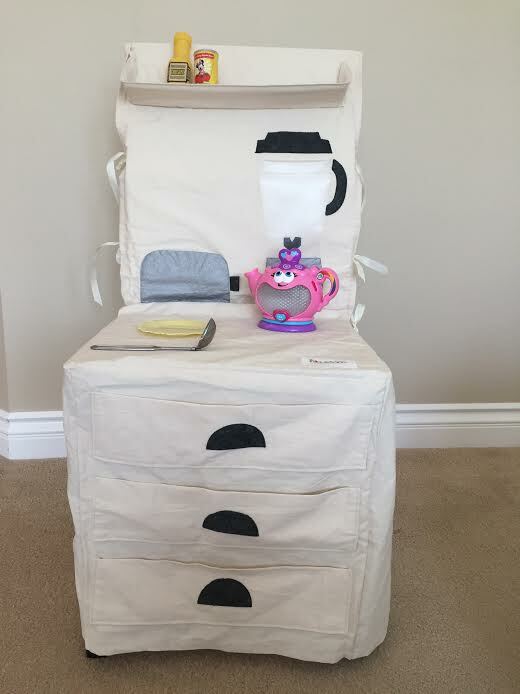 I followed the few, simple instructions: I unfolded the canvas, draped it over the chair, and tied the straps. Within minutes, the kitchen was set up for my daughter and son to play with. One thing to note is that the kitchen set does not come with its own pretend food or utensils. But if you are like me, that will not be a problem! We have tons and tons of pretend kitchen items all over the house. Also, I really feel like toys nowadays comes with way too many bells and whistles, leaving little to the imagination. The Pop Oh Ver kitchen is basic enough that it lets kids use their creativity while playing. Rather than pushing a button to make sounds, my son and daughter were using their creativity and making noises for the blender, frying pan, tea pot, etc. It’s wonderful to see things go back to the basic! Pop Oh Ver is a perfect toy for people living in apartments or smaller homes. Or, for people like me who like to keep their house neat and tidy. When play time is over, all I did was fold it and put it back in the small flat box that it came in. Within minutes, everything was clean and the house was no longer over-taken by my kid’s toys. The box is very compact, so it could be tucked under a bed, on shelves, or in a closet until the next play time. As my kids grow older and their collection of toys accumulate, I have come to dread big bulky toys or toys that has too many parts. The Pop Oh Ver pretend kitchen is a wonderful solution for my dilemma. It’s the perfect toy for both the parents and kids. My kids get the fun time that they want. But after play time is over, I get the neat house that I need! It’s a win-win for everyone! 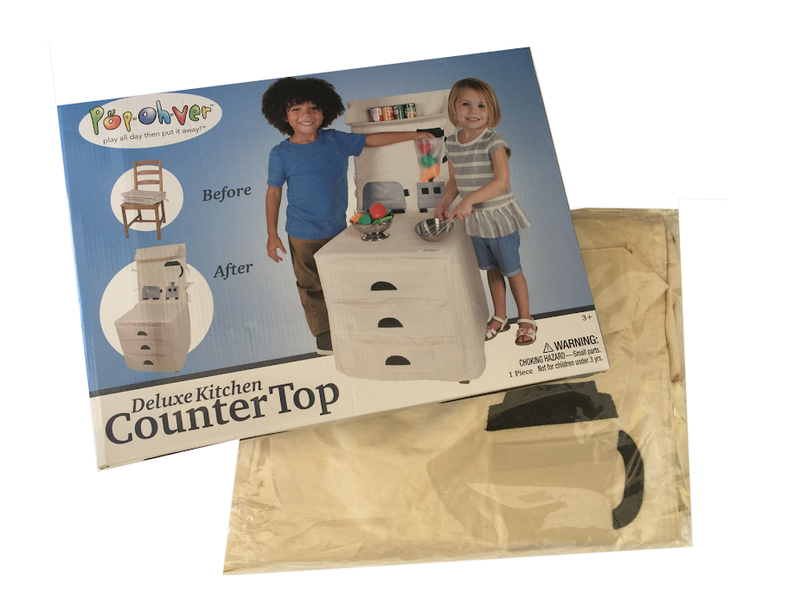 One Winner will Receive a Pop Oh Ver Pretend Play Kitchen Counter Top Set! This would be perfect for grandma's house! My kids love to pretend food network. I have 3 kids who always love to help me in the kitchen. This will be a nice set up for them when mom is taking a break from cooking. My daughter loves playing with a kitchen! she would love to play with this. My kids would love this because of how easy it would be to set up and take down.